Wyethia heleniodes, Belladonna, Borax, Calendula officinalis, Eucalyptus globulus, Mentha piperita, Plantago major, Terebinthinae oleum, Guaiacum, Phytolacca, Natrum salicylicum, Iodum, Thymolum. 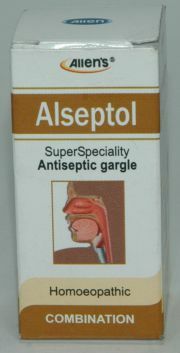 It is very effective in conditions of pharyngitis, tonsilitis, throat Irritation, throat congestion and dysponia. It is also useful in gumboils, stomatitis, oral infection and foul breath. 15 – 20 drops to be mixed with lukewarm water and gargle thrice daily. Explore more Allen Laboratories products.